Cut them out. Fold them up. Have fun. 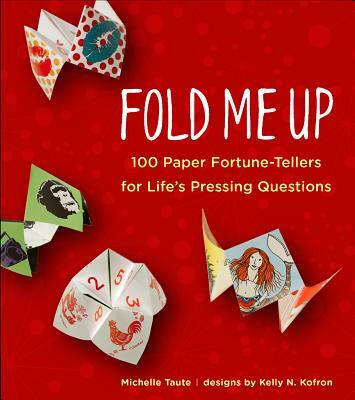 A grown-up twist on a childhood classic exquisitely designed paper fortune-tellers. Michelle Taute is a writer and content strategist. She creates compelling copy for magazines, blogs, websites, scrappy entrepreneurs and really big brands. Michelle s articles have appeared everywhere from Better Homes and Gardens and Woman s Day specials to Metropolis, Communication Arts and USA Weekend. She s also the co-author of "The Design Activist s Handbook "with Noah Scalin. Kelly N. Kofron is a graphic designer. Specializing in print publication design, she worked as an award-winning art director for I.D. Magazine before starting her freelance business as provider of book and magazine design and production, magazine redesign, publishing consulting, and illustration. She has worked for such clients as Coffee House Press, Writer s Digest Books, Emmis Publications, St. Mary s Press, Writer s Digest Magazine, HOW Magazine, Package Design, print, Horticulture, Hospitality Style, and VMSD.."